Read these 30 powerful scriptures to change your life. 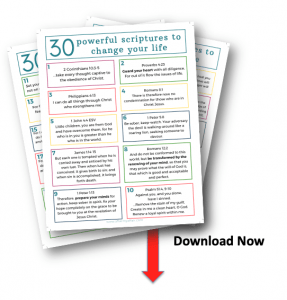 Print out and Memorize these powerful scriptures to change your life. You can skip to download all 30 verses at the bottom of the page. Do you ever feel like you’re in a battle with your mind or maybe you just keep returning to the same old habits? You want to do the right thing, but keep doing the wrong things instead. Is the affair recovery process making you weary? sucked back into our old ways and behaviors even- though we don’t want that! but you’re both still struggling to get past the affair. are usually up and down multiple times in a day. Some days it just feels like things will never be better. Every little change you’re making and every good decision you choose all adds up, in time, to a changed life for the better. But we also need to use this time to our advantage and not just hope things will get better. In my last 2 posts, I taught about the 5 ways your affair started in your thoughts. And also I broke down this Think-Feel-Act concept in what I call “The Bicycle Concept”, to make it easier to visualize. In this post, I explained how it’s the real reason you can’t get over your affair. we all are by our thoughts. The good news is, we don’t have to be victims of our thoughts anymore! will greatly affect the results you’ll get in your life. God says. When we think on His word, everyday, slowly but surely we’ll see our lives changing for the better. This isn’t a quick, microwavable fix though, my friends. We often want everything to happen fast, but most of the best things in life don’t work like that. and really meditate on one verse a day, you’ll begin to see a shift in your thinking after 30 days. into this mess to help you heal, and He’ll show up. and put it on your fridge. Whatever will work for you. But the most important thing is to meditate upon it at least 3 times a day, if not more. you to do that too. Replacing negative thoughts, with God’s word will begin to change you. from the life you really want, just say the verse out loud over and over again if needed. When we immediately replace those thoughts with God’s word, and HIS truth, those thoughts have to flee. I’ve listed the first 5 scriptures here, to get you started. to change your life, and your thinking. Download all 30 verses in an easy to read PDF below!